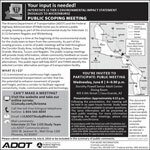 Public hearing speaker pre-registration is available for the Marana and Tucson public hearing locations only. Sign up below or call 1.844.544.8049(bilingüe) for more information. 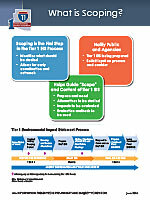 The Draft Tier 1 EIS is available for a public comment period, starting April 5, 2019, and ending on May 31, 2019. All comment methods are considered equal. 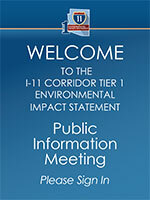 Six public hearings on the Draft Tier 1 EIS will provide information on the Recommended Corridor Alternative and accept formal public comments. 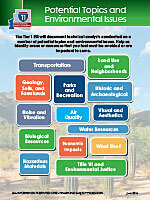 The same information and materials will be provided at each of the six public hearing locations. 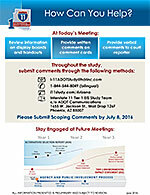 At each public hearing, members of the public can make comments on the Draft Tier 1 EIS in front of a study team panel (within a three-minute time limit). The public hearing is the only opportunity where three‑minute verbal public comments can be given in front of the panel. This portion of the hearing will be held for the purpose of receiving comments. It is not intended to be a question-and-answer session however, study team members will be available in the Open House portion of the hearing to discuss the Draft Tier 1 EIS and answer questions. Court reporters will also be available to record individual verbal comments. Comment forms and computers or tablets will be available for written comments. 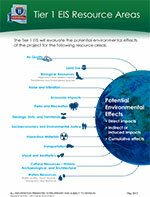 All comments will be documented, reviewed, and considered by the study team and responded to in the Final Tier 1 Environmental Impact Statement. The main objective of community outreach and public involvement is to solicit input through an open and transparent process that includes the public, businesses, property owners, agencies, stakeholders, tribal governments, and community groups within the study area. 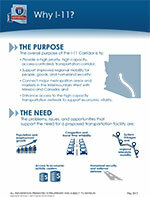 The process has been structured to involve people early and often, and to share information as it becomes available. Short project updates are frequently posted to the website, under Blog, to inform the public and stakeholders when new information is available and to provide additional information on project-specific elements. Those on the project mailing list will receive an email each time a new update is posted. 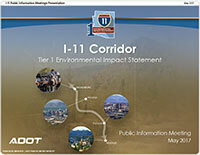 Join the I-11 Tier 1 EIS Mailing List to receive email blasts. Advertisements are placed in regional newspapers and with radio stations to announce meetings and other important study information. 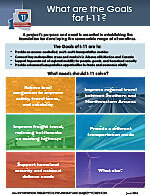 The project website is used to disseminate information and provide a schedule of events. 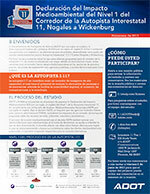 The site is presented in English, with the ability to translate information into other languages. 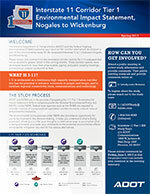 The website is frequently updated to feature new information, technical documents and reports. 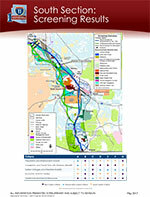 The website is updated with the intent of providing real-time project information. 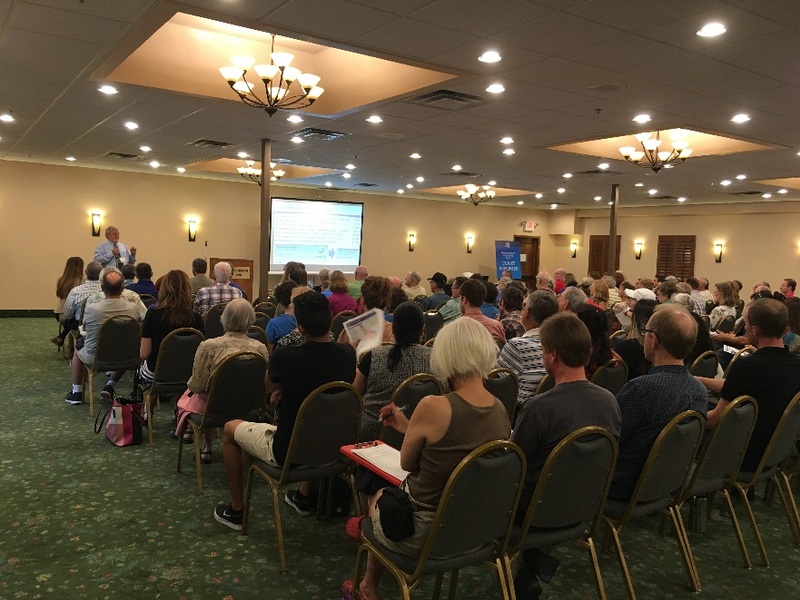 Corridor-wide public meetings have been conducted at major project milestones to cover specific topics and provide opportunities for the community to interact with the project team to discuss project issues and recommendations. 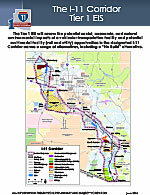 For information about the next corridor-wide meeting dates, times and locations, and to view information from previous meetings, visit Public Meetings and Outreach. 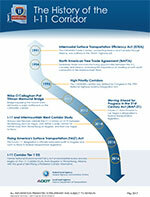 Under Section 6002 of the Safe, Accountable, Flexible, Efficient Transportation Equity Act: A Legacy for Users (SAFETEA-LU), agencies are responsible for identifying any issues of concern regarding potential environmental, social or economic impacts that could substantially delay or prevent an agency from granting a permit or other approval needed for the project. Section 6002 is intended to assure that agencies are fully engaged in the project and the decisions regarding the alternatives to be evaluated. 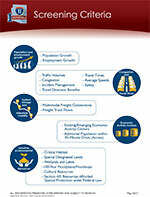 In addition to outreach to the general public, an extensive agency coordination process has been occurring simultaneously. 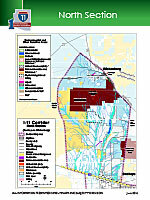 More than 60 agencies are included in the stakeholder database, including elected officials, federal agencies, tribal governments, organizations, special interest groups, and other interested parties. These stakeholders receive email updates regarding study progress, and they are invited to key meetings during the environmental review process. 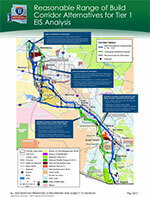 The Alternatives Selection Report documents the analysis of the proposed corridor options. Through this analysis, a reasonable range of alternatives was identified to be carried forward into the Draft Tier 1 Environmental Impact Statement for further study. The 2017 Agency and Public Information Meeting Summary Report documents the feedback received through the various outreach mechanisms on the alternatives screening process and the proposed reasonable alternatives. 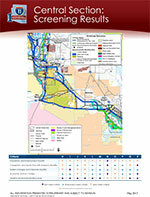 The Arizona Department of Transportation and the Federal Highway Administration held six public information meetings in 2017 to review and collect input on the proposed alternatives. 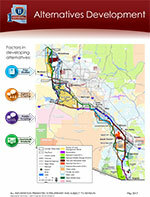 The meetings were held throughout the corridor study area: Wickenburg, Buckeye, Casa Grande, Marana, Tucson and Nogales. The meetings provided an update on the study and sought input on the alternatives screening process and the recommended range of reasonable alternatives that could be advanced into the Draft Tier 1 Environmental Impact Statement for further study. 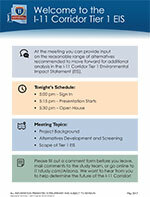 The alternatives evaluation public meeting materials are provided below. Select the thumbnails to view the presentation, fact sheet and display boards from the alternatives evaluation public meetings. 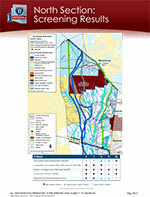 Select to download PDF version. 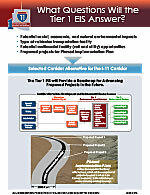 Select a board to download PDF version. Public Scoping is a time at the beginning of the Tier I EIS for the study team to learn from the community. 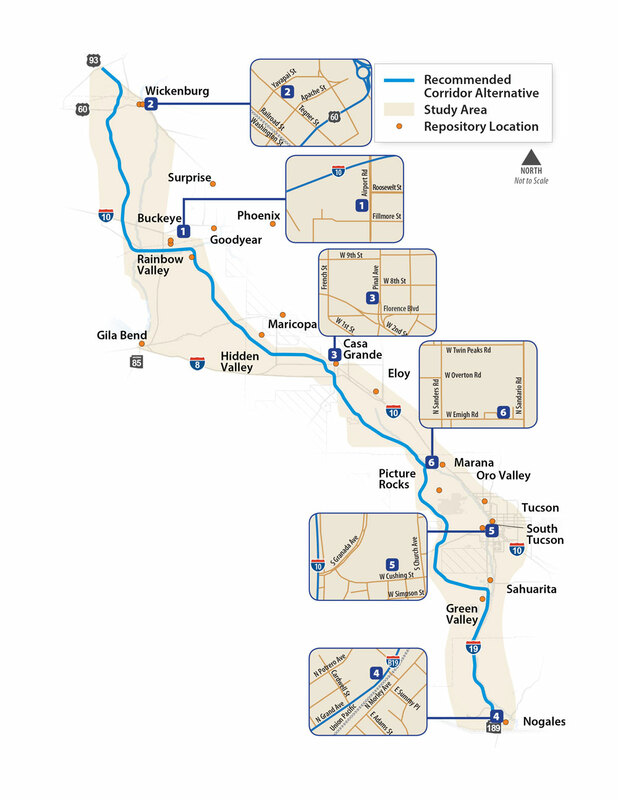 As part of the scoping process, a series of public meetings were held throughout the Corridor Study Area, including Wickenburg, Buckeye, Casa Grande, Marana, Tucson and Nogales. 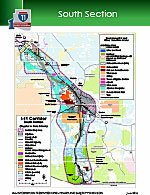 The public scoping meetings provided study information, obtained community feedback on issues in the Corridor Study Area, and solicited input to form potential corridor alternatives. 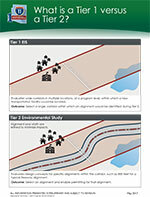 A summary of the scoping process and feedback received through the various outreach mechanisms has been documented in a Scoping Summary Report. 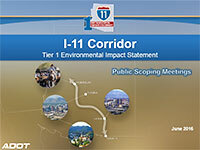 The Arizona Department of Transportation (ADOT) and the Federal Highway Administration (FHWA) held six public scoping meeting as part of the environmental study for Interstate 11 (I-11) between Nogales and Wickenburg. 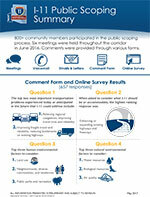 Public Scoping is a time at the beginning of the environmental study for the study team to learn from the community. 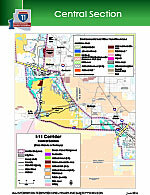 As part of the scoping process, a series of public meetings were held throughout the Corridor Study Area, including Wickenburg, Buckeye, Casa Grande, Marana, Tucson and Nogales. 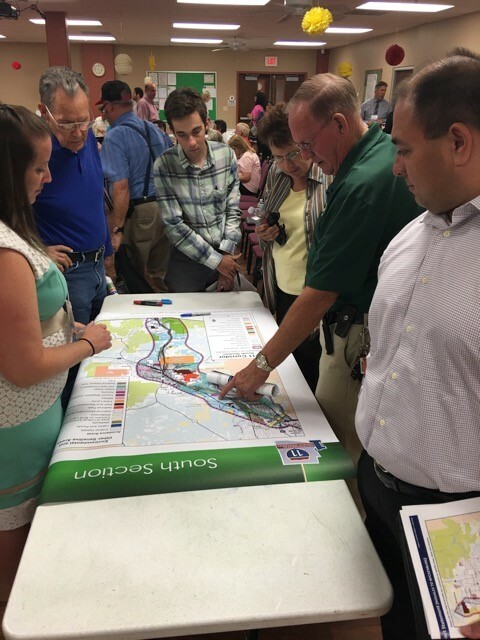 The public scoping meetings provided study information, obtained community feedback on issues in the Corridor Study Area, and solicited input to form potential corridor alternatives. 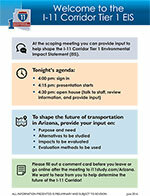 This public input will help ADOT and FHWA identify the selected corridor alternative and type of transportation facility. The following list outlines the public meetings were held during the scoping period. Each meeting was held from 4-6:30 PM, with a presentation at approximately 4:15. 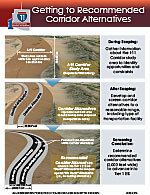 The same information was presented at each meeting. Following the presentation, the meeting will be held in an open house format with study team members available to answer questions. 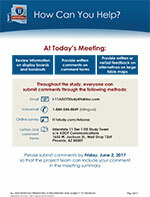 Select the thumbnails to view the presentation and boards from the public scoping meetings.